Yesterday ACT leader Rodney Hide, deputy leader Heather Roy, Upper South deputy board member Andrew Falloon and yours truly did a second recce around the Rakaia electorate. We toured several local businesses and the Ashburton Branch of Aoraki Polytechnic. There were also several media interviews. 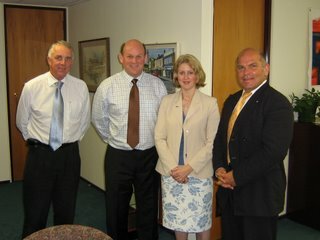 Rodney and Heather had a particularly productive meeting with Mark Lemon, the local vice president of Federated Farmers. Water and irrigation are key issues in what is one of the wealthiest and driest rural electorates in the country. Also excellent was a meeting with Ashburton mayor, Bede O'Malley. Health provision is clearly a big issue in the electorate as even affluent towns like Ashburton struggle to attract GPs and specialised medical staff. Centred in Ashburton and extending to the southern boundaries of Christchurch, the Ralkaia electorate is of strong interest to the ACT Party. If we're serious about getting our free market policies turned into legislation we need to not only increase our party vote, but also win more electorate seats. Only electorate seats can give ACT the permanence, certainty and stability required to make ACT a credible and influential third force in NZ politics. 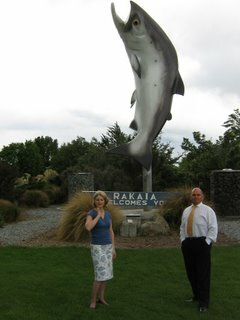 While Rakaia is one of the strongest National seats in the country, it has several unique features that make it a potential target for ACT. Firstly, with the current MP, Brian Connell offside with National and currently dumped from caucus, Rakaia has zero effective representation in Parliament. Secondly, Rakaia has traditionally been one ACT's best seats for party vote in the country. Thirdly, Rakaia's ACT committee is one of the most hard working and well connected in NZ. Fourthly, we have an excellent deputy board member in the region in Andrew Falloon. Being born in Ashburton and knowing the region intimately, Andrew's local knowledge would be a huge advantage. Fifthly, Rakaia is largely rural, but also contains Burnham Military Base and Lincoln University. ACT appeals to the rural community with its emphasis on low tax, less red tape and commitment to improved infrastructure. Our strong pro defence views are popular with the military and we have a big following among students and a very dedicated ACT on Campus team at Lincoln. Sixthly, the close proximity to Christchurch makes it easy to bring our very strong Christchurch campaign team in to help out. Seventhly, Heather and Rodney are well known and accepted in the electorate. Our 2005 candidate, Brian Davidson was very popular and while only campaigning for party vote, gained a very respectable number of electorate votes. Eigthly, we already have offers of an office and considerable other material support. Over all Rakaia is looking like a very attractive option. Do any ACT supporters have any views or suggestions on the subject? This is a useful development; I left Canterbury partly because the liberty action was all up in Auckland! My advice is to focus on winning Epsom again. That is priority no. 1. Anything else is a bonus. So what's the answer to this question: who? I think you will find, as National moves to the soft centre, that many freedom minded people will flock back to the ACT banner. Many rural people are receptive to the ACT message (I live in a rural area myself), all that needs to be done is to get that message out! While certainly not minimising the importance of retaining Epsom, I think there is fertile ground for ACT (no pun intended)in the rural areas. The RMA, poor infrastructure and shocking health and education provision impact heavily on riral people. Property rights issues and local government power mania are also big issues. ACT has a great message for rural people. We just have to get out and sell it.